We have original science fiction by Ted Kosmatka (“The One Who Isn't”) and Jilly Dreadful (“5x5”), along with SF reprints by Genevieve Valentine (“Small Medicine”) and Seth Fried (“Hello Again”). Plus, we have original fantasy by Rochita Loenen-Ruiz (“Magnifica Angelica Superable”) and Kenneth Schneyer (“Some Pebbles in the Palm”), and fantasy reprints by A. Merc Rustad (“Finding Home”) and Spencer Ellsworth (“The Child Support of Cromdor the Condemned”). All that, and of course we also have our usual assortment of author spotlights, along with our book and media review columns. 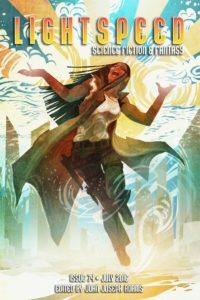 For our ebook readers, we also have an ebook-exclusive reprint of Walter Jon Williams’s novella “Surfacing” and a novel excerpt.